The cultural cold war between the superpowers that began after the Second World War played a major role in shaping the international arts and culture scene as we know it today. This series of articles discusses the impacts of cultural diplomacy, particularly that of the USA, on Finnish music from the days of the Cold War to the present. The first part focuses on the years immediately after the war. Finnish music came back to life immediately after hostilities ceased, and a new international era dawned. The Second World War halted performances of concert music in Finland almost completely by 1944–1945. The Great Hall of the University of Helsinki, the principal concert venue in the city, had been destroyed in air raids, and many members of orchestras had fallen in combat. In view of this, it is surprising how quickly and broadly concert activities sprang back to life after the war ended. Symphony concerts of the Helsinki Philharmonic Orchestra, for instance, became so popular that ticket office queues began to form in the early hours of the morning and often ended up being several city blocks long. This mirrored the situation in war-torn Germany, where people turned to culture as a means of mental wellbeing and as such perhaps even more important than water, food or coal. The revival of the music sector also led to music makers getting organised. The Society of Finnish Composers was established in 1945, and in the same year the Finnish Composers’ Copyright Society Teosto, founded in 1928, extended its membership to composers of popular music. In concert music, the mainstream style was Neo-Classicism; the music of Igor Stravinsky, for instance, established itself in the orchestral repertoire in Finland after the war. However, a greater popularity was attained by Dmitri Shostakovich, whose First Symphony and Piano Concerto were performed for the first time in Finland in 1945. Shostakovich came to be admired by a number of Finnish composers, such as Uuno Klami, Matti Rautio and Einar Englund. Englund’s First Symphony, premiered in 1946, has been compared to Shostakovich’s Leningrad Symphony and seen similarly as a comment on the brutality and senselessness of war (for a different take on this symphony, see the article by Antti Häyrynen). 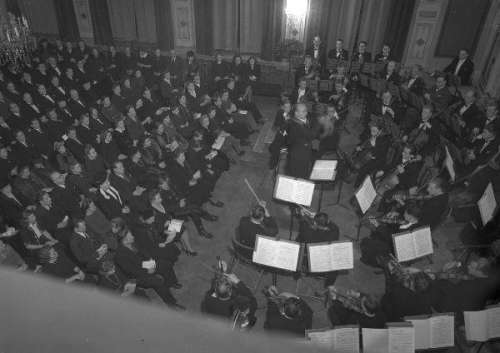 Eero Kosonen conducting at the first concert of the Tampere City Orchestra in January 1947. Photo: Jukka Raunio / Museokeskus Vapriikki. Towards the end of the 1940s, the young generation of composers developed an interest in atonality and in international modernist composition techniques, and the focus of Finnish music began to turn away from national topics. In 1949, a faction calling itself Nykymusiikki–Nutidsmusik [Contemporary music] split off from the Society of Finnish Composers with the stated intention of encouraging new music. Its aim was to promote “music of our time and older music that has specific links to modern trends”. This association was accepted as a member of the International Society of Contemporary Music (ISCM) in 1951. The Society of Finnish Composers, mindful of Finland’s cautious foreign policy, did not join the International Music Council (IMC) founded by UNESCO in 1949 until after Stalin’s death, in 1955. From the first, the Society of Finnish Composers maintained close relations to the Union of Soviet Composers, which had been established by a decision of the Communist party in 1934. In other respects too, Finland served as a showcase towards the West for Soviet artists throughout the Cold War. The Leningrad Philharmonic Orchestra came to Finland in 1946 on the orchestra’s first trip abroad since its founding in 1882. This was perhaps the most significant cultural policy event in Finland in the post-war years. The USA, the Western superpower, extended its cultural propaganda programme to Finland in the early years of the Cold War. The Fulbright Program was established in 1947, but for reasons of foreign policy sensitivity Finland could not join it immediately. The USA then proposed that Finland’s repayments of loans dating from the First World War be directed to the ASLA programme (from the Finnish acronym for “Grants from the American loan to Finland”), which began in 1949 and became the cornerstone of cultural exchange between the two countries. Several private parties in the USA offered cultural exchange grants to Finnish composers, under the auspices of the State Department. One of the first beneficiaries was Englund, who went to study at Tanglewood and in New York on a grant from the Rockefeller Foundation – often regarded as a key conduit for CIA funding – in 1949. In the following decades, a significant number of major players in Finnish music studied in the West on funding provided by the US State Department. We will take a closer look at this in the second article in the series. The United States Information Service in Helsinki organised broadcasts of American music and distributed leaflets promoting American culture and art, including musical propaganda. The Finnish-American Society also organised musical events jointly with the State Department and USIS. At a symphony concert given in November 1945, the Helsinki Philharmonic performed William Grant Still’s Afro-American Symphony (1930) under Martti Similä. It is indicative of the diplomatic significance of the event that representatives of foreign embassies and of the Allied Control Commission were invited and that the spouse of the President of the Republic also attended. In 1947, the Tampere City Orchestra under Eero Kosonen performed at a concert organised to publicise American culture, featuring music by Aaron Copland and George Gershwin. 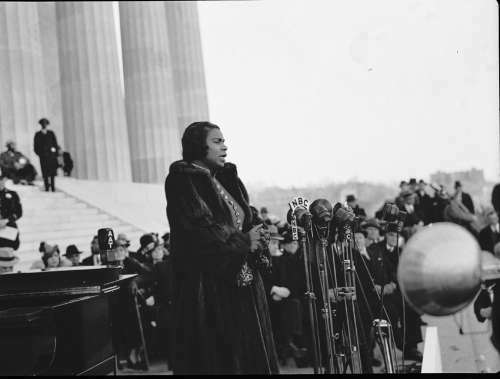 Marian Anderson sings at Lincoln Memorial in 1939. During the Cold War, the USA sent a large number of conductors, musicians and experts to Finland. Considerable attention was given in the Finnish media to visits for instance by violinist Yehudi Menuhin (1948), conductor Antonia Brico (1946, 1947), pianist Alexander Borowsky (1949) and soprano Marian Anderson (1949). In the 1940s, the propaganda programme focused on eulogising the “advanced democracy” of the United States. Many of the musicians sent abroad for publicity purposes were Jewish or black – or women, such as conductor Antonia Brico or singer Marian Anderson, who in 1955 also became the first black singer to perform at the Metropolitan Opera in New York. She was a friend of Sibelius and performed his solo songs frequently, and she had in fact visited Finland earlier, performing with Finnish pianist Kosti Vehanen, entirely in the spirit of musical diplomacy. We should note that although the State Department began sending performing artists to Finland in the 1940s, the actual cultural exchange programme between Finland and the USA did not begin until 1954. This was preceded at the turn of the 1950s by a shift in cultural propaganda towards subtler cultural diplomacy. Tanja Tiekso, PhD, is a researcher at the University of the Arts Helsinki. Currently, she is conducting her research at the Columbia University in the city of New York. This series of articles is based on her previous research ”New music in Finland during the Cold War”, supported by the Finnish Cultural Foundation. The following parts of the series will discuss the 1950s, the 1960s and finally the state of Finnish music from the late 1970s to the present. The second part will be published in April 2018. References for this article include the archives of the League of Finnish-American Societies, the archives of the Society of Finnish Composers, the history of the Society of Finnish Composers (Salmenhaara 1995 and Marvia 1970), the history of the Helsinki Philharmonic Orchestra (Marvia & Vainio 1993), the history of the Finnish Radio Symphony Orchestra (Karttunen 2002), History of Finnish Music 4: Music of our time (Aroheimo-Marvia & Heiniö 1995), Einar Englud’s memoirs, the archives of Päivälehti, Marek Field’s dissertation (2015) on British and American cultural propaganda in Finland after the Second World War, and international studies on contemporary music in Europe after the Second World War and on music diplomacy of the United States during the Cold War. Featured photo: Representatives of the Allied Control Commission and the President of the Republic attended the event organised at the Messuhalli of Helsinki in 1946. Photo: Väinö Kannisto / Helsingin kaupunginmuseo.